I've been waiting to get these in for review ever since the HeadFi meet back in the fall of this year. I came into that expo with Taction marked as a stop, since they had claimed quite a lot about their products on their website, and I wanted to briefly put them through their paces. I'm fully willing to admit that after having heard many "bass boost" headphones, the only commonality between them being their almost-universal terribleness, I was skeptical, at the outset. These headphones are quite a different animal. They feature a custom-designed tactile driver, which is adjustable in its intensity, and that vibrate the earpads laterally, alongside the normal driver in the headphones. There's a fairly comprehensive article that's accessible on Taction's website that details a little bit more about the development process for the driver, and speaks more to the specifics of the technology in its implementation. For those curious, that's linked here, since they do a better job discussing their technology than I can. Basically, the main components that drove their development of a custom driver were variable intensity at all required frequencies, along with high stopping speed and clarity of vibration. These two combine to allow a tremendous range of touch and clarity to the added bass effect. Additionally, this is far from just adjusting the acoustic damping of a headphone to allow for more bass. The tactile response is an entirely separate feeling, and communicates the feeling of large speakers (and primarily subwoofers) surprisingly well. This obviously isn't the same as having an SVS Ultra sitting under your desk, kicking out waves of low frequency, but it certainly gets far closer than any headphone that I've ever heard. But with that little introduction to the technology out of the way, let's get into the meat of this review. The headphones are fairly utilitarian looking, with their mainly matte black, plastic casings. The headphones adjust via a non-incremental slider which is none-too-finicky, thankfully. The back of each earcup is occupied almost entirely by a metal-cast, resin-filled Kannon logo, which looks and feels very industrial. These headphones certainly don't feel like they'll break any time soon. The cable that terminates at the right earcup is covered with a fabric, and leads to the dongle at the center of the full cable length. This dongle has two knobs, one which controls volume while the other controls the intensity of the tactile drive. 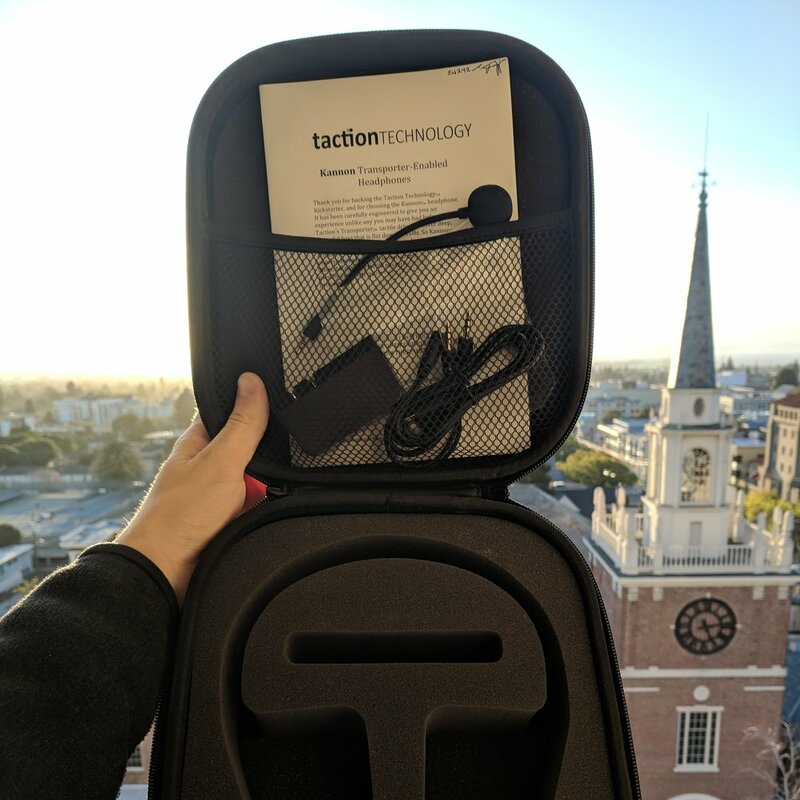 This dongle also has, on its surface, two buttons - one with a version of Taction's logo that turns on and off the tactile driver and the other which mutes and unmutes the included microphone, when plugged in. This microphone is of good quality, and works well; it attaches to the port on the right earcup, which is visible below. It's a boom microphone, which holds position well and flexes pretty easily. There's also an included wind-guard/pop-filter, which was a nice touch. The dongle also has a micro-USB port next to the 3.5mm auxiliary connector that carries the cable to its termination at the source-end. This is used to charge the dongle to power the tactile driver. I only had to charge it once in my time with these, so battery life is a plus, even though I've been running these drivers pretty hard, fairly consistently. Alongside what's mentioned above, included is a micro-USB charging cable and wall-wort, along with a Y-splitter for systems with a separate microphone input line. Also included is a case that is absolutely massive, although seems to be very protective. It zips shut and holds the headphones, along with all of the above mentioned accessories. I don't think this case truly can count as portable, as I'd have a very hard time fitting it even in my backpack. Generally speaking, though, these headphones seem fairly rigorously and well designed, and I've got essentially no qualms. They don't feel cheap, but they, admittedly, don't have the same touch of luxury as other headphones in this price range - although that's not the point of these headphones. The extra cost goes into all of the R&D and direct-cost required for the tactile driver, alongside all of the other circuitry that's necessary to ensure that those drivers work well. This is a very hard review to approach, as I truly don't have a valid comparison point. There simply isn't anything extant on the market right now that I've heard that remotely compares to these headphones. This isn't to say that they are the best thing that I've ever heard - far from it. But, they are very competent headphones, with pretty good imaging and relatively good separation. With the tactile driver disabled, they are actually relatively mid-centric, to my ears. The tactile driver is completely adjustable, from nothing all the way up to, "10," which I very much appreciated. It allows the end-user to tailor the intensity to exactly their preferences. At maximum, the tactile drivers add a level of bass immersion and feeling that I have never experienced in a headphone before. It's something that, again, I can't name a comparison point for, since this is the first time I've experienced anything like it. It brings an approximation of speakers that is by no means exact, but that I haven't heard yet in a pair of headphones. It certainly gets much closer than anything I've heard before. As a result, these are one of the more fun pairs of headphones that I've recently heard, and they remain consistently engaging across genres, partially as a result of the lack of bass distortion that comes from using a wholly separate driver for the accenting of the range. The headphones are closed-back, fully, and that means that you get pretty solid isolation, along with relatively little leakage. If I were to take these out in public, I'm sure that I wouldn't be annoying anyone around me. Well, this is the range that is going to get the most attention. I pretty consciously selected by test tracks here to cover the fullest range that I could. Starting at sub-bass, there's no rumble like these. When kicked up to maximum, the bass remains clear and undistorted, while not bleeding over into the mid-range. And in, "Three Ralphs," my de-facto standard test track for sub-bass (if you haven't yet noticed, it's in almost every "Bass" section of a given review) the headphones shake like I've never felt before. It isn't loose, or sloppy, however; quite the opposite, in fact. The tactile driver is seriously responsive and very capable of doing what is advertised. It is complementary, and very much so, but detracts almost nothing from the experience. Taction must have been correct in their research into how sensitive the around-ear area is to tactile response, because the effect feels can though it's intrinsic to the music. It isn't as though the headphone is doing something separate and distinct from communicating sound, with its tactile driver - the integration feels very cohesive and well-implemented, such that it only adds to the experience of the music, without forcing the user to do any extra mental work to integrate the new tactile sensations into their experience. Major, major props to Taction for pulling this off so well. It is fully adjustable, can suit anyones tastes, and adds a lot to every genre that I put through it. Shockingly, even with jazz and classical, the addition of tactile sensation serves almost exclusively as an extra element of immersion in the music. In this range, there's still a bit to talk about. Having turned off the tactile driver, so that I can focus a bit better on it, the mids are very clear. There is little emphasis within the range - male and female vocals come through with good clarity and detail, and without much coloration. Instrumentation is well-detailed, just like prior mentioned, and everything remains pretty crisp. The headphones have a pretty good sense for touch and fidelity, generally speaking, with instruments in general coming across as relatively natural and realistic. I don't have many major detriments or further comments in this range, although I will say that the upper-mids can become a bit sharp, depending on the track. The treble is largely inoffensive. I did catch a couple instances of sibilance, but that's to be expected with most every headphone that crosses my desk. Otherwise, this range adds a good sense of space and air to the music, which is necessary given the bass register as discussed above. Cymbals come through with good fidelity, although I will say that I've heard them done a bit better in past headphones - but that's to be expected. The treble is not the focus of these headphones, as I hope would've been made obvious by this point. This really was a tough review to write. At the least, it's good for me to have this comparison point to other options in this market as it develops (which I'm assuming it will, over time). But, aside from all that, they're a very good early-mover in this market sector. The tactile driver is very well-implemented, and pretty much refuses to interfere with the other frequency ranges, which I appreciated. The experience of a good tactile driver can't be beat for those looking for a truly immersive, speaker-esque experience in a pair of (theoretically) portable headphones. I would like to see a smaller case included in the future, as the included one pretty much precludes users from taking it with them in anything except for a suitcase, in my experience. Otherwise, the headphones are well-built, well-accessorized, and represent the best implementation of this idea that I've yet seen. They add a lot, and take away shockingly little for the improvements that the user gets. These headphones were provided to me by Taction Technology. I am not being paid by anyone to write this review, to endorse the product reviewed, or for the content that I put in the review. These headphones were provided signal by an Astell&Kern AK Junior, a Google Pixel, a Neurochrome HP-1, and by whatever soundcard is in the motherboard of my computer. I have had these headphones for about 3 weeks, and I have put about 40 hours of analytical listening through them during that period.